Much confusion surrounds the topic of psychic contamination and entity attachments. There are many ideas as to the essence and origin of these phenomena and the forces, emanating from beyond this plane of existence, that can enter and affect our lives. Theories abound regarding their nature; from them being discarnate beings and thought forms, to hooks and attachments, to psychic debris and imprints. While the opinions amongst those who study them are as varied as the phenomena discussed, there is agreement that there are disturbing and powerful forces, from outside the physical plane, that often invade our lives and permeate our environments. People want to believe that everything they think and feel is their own, coming from their own conscious or subconscious mind, but the evidence shows that these external forces can affect one’s thoughts, emotions, moods and dispositions. For the purposes of this discussion, an entity is any psychic contaminant; anything perceived as outside of you that feeds off your energy or emotions. These emotions become the entities nourishment, their fuel source. It can be a thought form that has taken on a life of its own, environmental influences (the past remnants of severe emotional intensity), or external "dark entities" or "demonic forces". 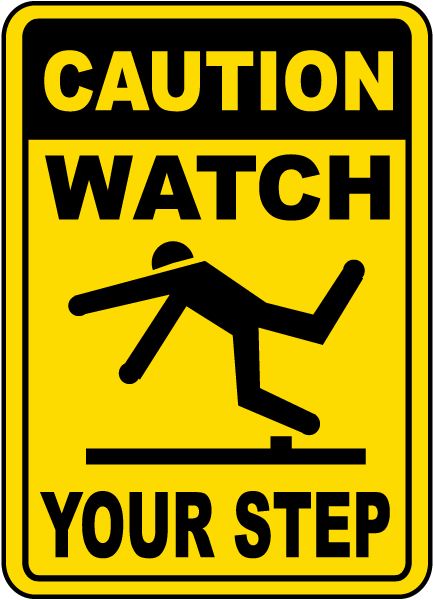 Programming: Childhood abuse and oppression caused by an authority figure may leave powerful negative imprints. Relationships that have ended unpleasantly may leave negative "strings" attached. 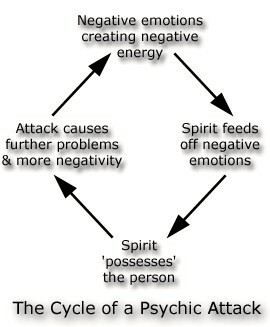 Psychic attack by another person: Another person's anger, jealousy or other negativity toward you may be strong enough to constitute a psychic attack on you. Places hold residual vibrations from past negative actions associated with them and battlefields and disaster sites can be strong sources of entity activity. 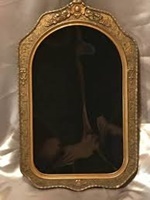 Objects also hold residual vibrations from past negative associations and one should be aware of this when dealing with antiques and antique stores. In Feng Shui, the cleansing of antiques of spiritual dust/garbage is taken very seriously and after a day of "antiquing" it is advisable to do a personal cleansing as well. Earthbound spirits that survive after death of the physical body. Sometimes spirits just don't know what to do when their physical body dies, so they stay in the earth plane and can attach to living people, or remain in a specific place (thus a haunting spirit or ghost). These entities have never been alive in their own physical bodies, and are usually on a mission to incite negative and violent emotions. Commonly labeled as “Satan” or “Fallen Angels”, no one really knows where the dark energies come from. Some theories suggest that negative thought forms give dark forces the tools needed to create these beings. Other theories say is that they may be pan-dimensional beings that enter into this dimension through “doorways’ opened by negative emotions. Demons rarely manifest themselves as they truly are. Their hatred, rage, and desire to feed upon chaos are hidden behind subtle and carefully chosen disguises, often manifesting in the guise of angelic beings. Rarely would anyone follow these creatures if they dared to show themselves. Demons have an extensive knowledge of human nature and the psychology of man. Demons can size up an individual and determine a plan of destruction for an individual or group of individuals. Demons have the wisdom of the ages at their disposal and can draw upon that vast knowledge. With their penchant to exploit human weaknesses and their desire to feed upon negative energy these dark entities and demonic forces should be treated with deadly seriousness. The Jinn, also known as djinn or anglicized as genies, are supernatural creatures in early Arabian and later Islamic mythology and theology. They are mentioned frequently in the Quran and other Islamic texts and inhabit an unseen world, another universe beyond the known universe. The Quran says that the jinn are made of a smokeless and "scorching fire", but are also physical in nature, being able to interact in a tactile manner with people and objects and likewise be acted upon. The Jinn are akin to demons in Christian tradition, but the jinn are not angels and the Quran draws a clear distinction between the two creations. Jinn are ususally invisble to humans, but humans are clearly visbible to the Jinn as they can possess humans. 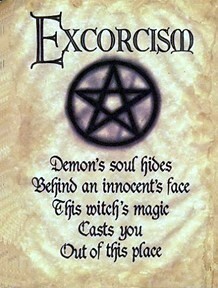 Religious exorcism is mainly thought of as the rite of driving out the Devil and his demons from possessed persons. Exorcism is mainly performed in incidences of demonic possession that is generally distinguished from spiritual possession. A general assumption is that the Roman Catholic singularly practices the rite of exorcism, but some Protestant denominations such as the Pentecostals and other charismatic groups practice it as well. These groups refer to the practice as "deliverance ministry" where gifted people drive out devils and heal while they touch the persons with their hands, ("laying on of hands") and pray over them. The greatest danger to the exorcist is becoming possessed by the Devil or demon himself. This is the reason why the exorcist must feel as free of sin as possible and feel no secret need for punishment. Otherwise, the Devil or demon can easily entrap him. The former Jesuit priest and professor, Malachi Martin, stated in his book "Hostage to the Devil" that much of the success of the exorcism depends upon the exorcist. To Martin, the most important thing is the exorcist's disposition and those of his assistants. Very few experienced exorcists would ever choose to work alone. Spirit release or secular exorcism differs fundamentally from religious exorcism in that it attaches no blame to the patient, is less traumatic for the patient and moves the attached spirit to an appropriate place for the spirit identified, rather than expelling it from the patient only to wander and attach to someone else. ...TO NOT GET ATTACHED IN THE FIRST PLACE. Although spirit and demonic attachments happen to people through no fault of their own, many people actually “invite” these attachments through their ignorance, arrogance and stupidity. Ouija boards and séances have been used by thousands of people untrained in spirit communication. Both forms of communication are dangerous because they are usually uncontrolled forms of communication. Most often the spirits are those who reside on "the lower astral plane". These spirits are often very confused and may have died a sudden violent death, often through murder or suicide and there may be violent, negative and potentially dangerous conditions present when using these methods. or friend is through a Ouija Board. humans. Others find joy in giving wrong or harmful information. If you have a Ouija Board I strongly urge you to get rid it now!" 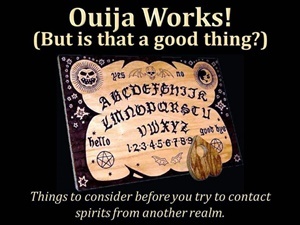 The warning about Ouija Boards also applies to the practice of Scrying when attemping spirit communication. In conclusion; there is no divine light, no sacred prayer, no sorcerer’s bane, no mystical shield, no magical talisman, no hallowed circle, no purifying incense and no holy water that is an impenetrable wall of psychic armor. Protection only comes from a proper disposition, a clear mind, an informed perspective and an awareness of your own strengths and weaknesses and those of the psychic emulators you may encounter.